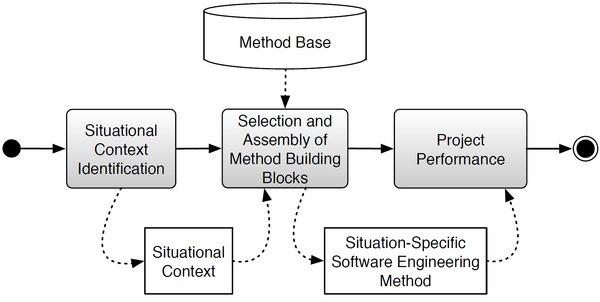 Situational Method Engineering (SME) encompasses all aspects of creating a method for a specific situation. The research group Database and Information Systems develops approaches for the creation and adaptation of software engineering methods. The best way to handle the complexity of large software engineering endeavors is to use defined software engineering methods. For example, software development methods prescribe and coordinate the activities necessary to plan, build, deliver and maintain the software. They thus describe a software engineering endeavor in all its relevant aspects, including the engineering process and its activities, the roles involved, the artifacts produced, and the tools and techniques that are employed as well as relationships between these concepts. Many different software engineering methods were proposed and are in use today. Examples for popular software development methods are the Rational Unified Process (RUP), V-Modell XT or Scrum. The existing variety demonstrates that there exist no single one that fits all software development endeavors, but moreover none of these generic “off-the-shelf” methods can take into account all the particularities of a certain project and organization. These particularities are often termed situation of an endeavor. The mismatch between the situation and the used software development method poses risks in terms of wasting time and budget and compromising the quality of the software product. Approaches of the first category usually fall short in providing sufficient flexibility or control in the development of a situation-specific method. The research group Database and Information Systems focuses on providing solutions to the challenges of the latter two categories.